At least 99 percent of the people who petitioned higher authorities for many years to have their grievances redressed are paranoia patients. This remark by a professor is not just offensive, but also sends a wrong signal to departments handling petitions. The print media and online forums have rightly condemned him for his irresponsible remark, and demanded that he apologize especially because he is an expert with the Ministry of Health and the head of Peking University's judicial appraisal institute. The professor's words imply that all such petitioners suffer from mental disorder and should be admitted to correctional institutes. By lashing out at the petitioners instead of criticizing local governments for their inability or inaction, which forces people to approach higher authorities, the professor has put the cart before the horse. It is such irresponsibility that has encouraged local governments to admit petitioners to mental hospitals. Officials have even made some petitioners sign papers saying they never again approach higher authorities for redressal of their grievances before releasing them. Perhaps such officials have forgotten President Hu Jintao's remark that the petition system has been put in place to solve people's problems and help build a harmonious society. Hu has made it clear that officials handling petitions will have to deliver the goods. The head of the State bureau handling petitions said in 2003 that 80 percent of the petitioners had enough reason to seek proper solutions to their problems and that such cases should be handled by local governments. Last year, the Party secretary of Urumqi, capital of the Xinjiang Uygur autonomous region, corroborated the State petition bureau head while handling petitioners' problems. To be honest, some of the petitioners have indeed come up with senseless demands. But there is no reason to believe that all petitioners suffer from such a malaise. Nor is there any reason for officials, especially those who receive and handle such cases, to be hostile toward the petitioners. The professor's remark is offensive because it encourages officials to discriminate against petitioners instead of making those in power take proper steps to end the grievances. It is likely that some of the petitioners have become paranoid. But their paranoia has been the result of higher authorities' failure to solve their problems or the harassment they have faced from local governments. The petition system is supplementary to the country's rule of law. It is a channel where people can air their grievances, protest against irregularities of officials at various levels, and thus help build an honest and clean government. So it is the responsibility of local governments to ensure that the system functions smoothly. And the first step in that direction is not to treat petitioners as lunatics or troublemakers. Instead, officials should deal seriously with the administrative irregularities that create problems for people. The professor published an apology to the petitioners on Monday. 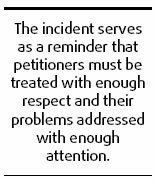 Still the incident serves as a reminder that petitioners must be treated with enough respect and their problems addressed with enough attention.